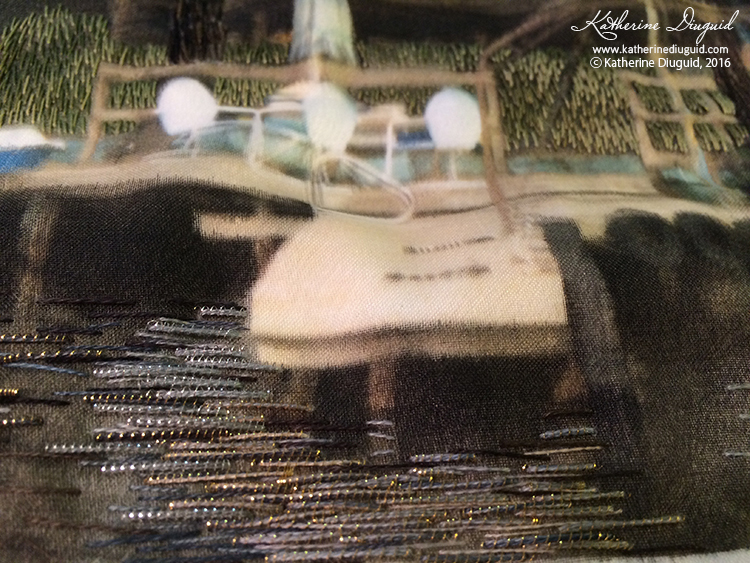 Unexpected things happen when you mix colored threads with metal threads in embroidery—the metals cast their reflections onto the threads, changing the perception of the colors to the viewer. The expectation is for the metal to reflect the light. The excitement lies in the unpredictable nature of how the reflections affect the perception of the surrounding colors and how these perceived colors change as the metals age. Color theory principles are seen in their extremes when mixed with the metal threads. The natural reaction when approaching gold is to assume it is a yellow, making purple its complement according to traditional color theory principles. However, purples appear black against the gold quickly, as they get darker. The lighter the purple, the more it begins to take on a golden appearance. The metal threads create a glow that both captivates and entices viewers with its rich appeal. Through this research, optical mixing was analyzed and explored with stitched samples to discover how to maximize a limited color palette and the luster of the metals in composition. Exploring Color Interactions Illuminated in Goldwork Embroidery explores these color relationships in metal thread embroidery by combining a variety of colored embroidery threads with the metals in different stitch experiments. Within the project, color theory principles are applied to goldwork embroidery to experiment and understand the metal’s effect on these color relationships. Traditionally, most color explorations have utilized flat color (either painted or paper) or light to evaluate the color interactions. This project is unique, as it accommodates for the patterns and shadows that naturally appear in stitching. As a consequence, this project addresses the effect of stitch pattern on color interactions by stitched samples of the same color combinations and compositions with a variety of stitch types and techniques. Samples with non-metals are used as a control method of evaluating the metal’s effect and the stitch pattern effects on the color interactions. This project combines practical research through the creation of exploratory samples and theoretical research. An embroiderer’s color palette is limited to the color threads they can source unless they commit to the extensive time required to master and then create hand-dyed threads. These color limitations act as both a constraint and foster creative innovation. To achieve the desired colors and visual affects, color blending must happen through thread mixing, stitch choice and stitch repetition. Shadows and patterns created by stitch texture must be accounted for within the design process as they directly affect the perception of colors and composition. Most exciting is the innovative ways embroiderers over the centuries have utilized stitch pattern to create the illusion of multiple colors. Medieval embroiderers created spectacularly rendered images on many prized Opus Anglicanum artifacts by utilizing swirling lines of split stitch in minimal colors. The shadows from the delicate split stitch contoured the images generating the appearance of many colors. Contemporary artist Cacey Zavaglia layers stitches in a sophisticated color order to create the complex shading of her embroidered portraits. These innovative methods that embroiderers utilize to sculpt colors blurs the line between 2-dimentional and 3-dimentional work as the stitches grow and layer above the surface. The Impressionist painters were credited with modernizing the use of color in the world of art. Taking inspiration from contemporary color theory and combining this with new innovations in paints, these artists revolutionized the creative use of color and paved the way for the Post Impressionists and Early Modern painters to continue to push the boundaries of color representation and mixing. Images were deconstructed and the perception of colors created using sophisticated color relationships allowing the colors to reverberate in a similar way as light dances on the surfaces of the objects and landscapes that we see. In observing the paintings of the Impressionist and Post Impressionist painters, many similarities can be drawn from their use of color and the color interactions observed in embroidery throughout the centuries from Opus Anglicanum to Audrey Walker. The textural surface, the use of color relationships to create perceived colors and emotions, the stroke and direction of the brush or stitch—all of these provide important avenues for comparison between the two mediums. Following detailed research, many questions arose concerning how the two mediums could inspire each other and promote innovation in their fields. This project identified many visual connections and evaluated the visual impact of color exhibited in each medium and how that impact was created. In looking to painting, this project reached beyond its own discipline and roots within craft and extended the discussion of the visual merits of embroidery as art. Key painting influences: Claude Monet, Berthe Morisot, Alfred Sisley, Vincent van Gogh, Chaïm Soutine and Paul Klee. Key embroidery influences: Opus Anglicanum, Audrey Walker, Rozanne Hawksley, Jan Beaney, Jean Littlejohn, Cacey Zavaglia, Beryl Dean, Hand & Lock and Lesage. Exploring Color Interactions in Goldwork Embroidery represents only the beginning of research intended for this topic. This project exemplifies the breadth of knowledge created by balancing theoretical, creative and studio research and by viewing subjects from a cross-disciplinary manner. The knowledge gained through this project has become a university course, “Color in Fibers”, allowing students the opportunity to draw connections between art theory knowledge and their studio work. It has opened a dialogue on the importance of studying embroidery technique and artistry for a broader audience, bridging traditional color theory with fiber, textile and fashion applications. Going forward, this project will further investigate color theory written by Ogden Rood and Michel Eugène Chevreul and will further evaluate painters that used gold extensively in their work, such as Gustav Klimt. Further studio research will be conducted through an ever-growing list of samples to stitch. Exploring Color Interactions in Goldwork Embroidery was funded in part through a Faculty Research and Professional Development Grant awarded to Assistant Professor Katherine Diuguid by North Carolina State University’s College of Design Research and Extension Office. Museum private appointments: Clothworkers’ Centre for the Victoria & Albert Museum, the Royal School of Needlework archives, Constance Howard Textile Collection at Goldsmiths University, Hand & Lock, St. George’s Chapel at Windsor Castle, St. Paul’s Cathedral Broiderers Studio and Collection, York Minster Abbey Broiderers Studio and Collection, Durham Cathedral Broiderers Studio and Collection and Liverpool Cathedral. Albers, Josef. Interaction of Color. 4th Edition ed. N.p. : Yale UP, 2013. Print. Box, Richard. Color and Design forEmbroidery: A Practical Handbook for the Daring Embroiderer and Adventurous Textile Artist. Washington, D.C.: Brassey's, 2000. Print. Burr, Trish. Colour Confidence in Embroidery. Binda, NSW. : Sally Milner, 2011. Print. Chevreul, Michel Eugène. The Principles of Harmony and Contrast of Colours, and Their Applications to the Arts. N.p. : FQ Pub, 2010. Print. Howard, Constance. Embroidery and Colour. New York: Van Nostrand Reinhold, 1976. Print. Rood, Ogden N. Modern Chromatics, with Applications to Art and Industry. New York: D. Appleton, 1879. Print. Thomson, Belinda. Impressionism: Origins, Practice, Reception. New York, NY: Thames & Hudson, 2000. Print. "Color: Inspirations, Theory and Application." Personal interview with Jan Beaney and Jean Littlejohn. 9 Oct. 2015. Research poster presented at the 2016 textile society of America biennial symposium in savannah, ga.